When you rent an apartment, you may not think of management as one of the amenities. The truth is that there are significant differences between professional management companies and independent landlords, and this can actually be the biggest factor affecting your comfort and satisfaction. Which option is best? As with anything else, the answer lies in your personal preference. Here's a side-by-side look that can help you decide. Management companies offer a reassuring level of consistency. The flip side is that you may have more flexibility in negotiating with an independent landlord regarding issues like rent and apartment modifications. Independent landlords may be less concerned with operating "by the book." While policies such as move-in and move-out inspections may seem tedious and restrictive, they actually protect you as much as management, making disagreements less likely and more easily resolved. 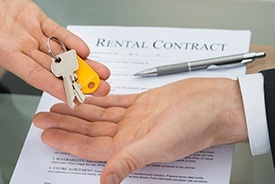 As a renter, you have the benefit of state and federal laws safeguarding your rights. Professional management companies stay up-to-date on all legislation, but you can't necessarily assume independent landlords will be equally conscientious. Communities with a professional management company have dedicated maintenance teams tending to the apartments, grounds and amenities. Independent landlords usually have other obligations, so you may have to wait until they can make the time to perform maintenance and repairs. Professional management companies invest time and money in upgrades to keep their apartment communities looking clean and contemporary, while independent landlords don't always have the same motivation or incentive. A professional management company will almost always have an on-site office, so they can offer special attention like accepting packages or keeping an eye on your apartment home when you're out of town. On the other hand, an independent landlord may not live in the same city or even the same state. Since you interact with an independent landlord on a one-to-one basis, you may end up developing a closer relationship, which can be a plus if you remain on good terms. However, it can be less problematic to have the cordial but more formal relationship that comes with a professional management company. At Springs, we know you have a wide range of choices in apartment living. That's why our on-site management teams go the extra mile to provide five-star service as well as extras like holiday get-togethers and other resident events. Stop in today and learn more about our Springs Pledge to Our Customers!